In January of 1882 the Dominican Fathers of Lewiston, Maine acquired two parcels of land at the corner of Lincoln and Chestnut streets that had been owned by the Franklin Company, owners of the nearby Continental Mills. The Dominicans commissioned the building to serve as a school in conjunction with Saint Peter’s church (the predecessor to the Basilica of Saints Peter and Paul) and to educate the children of the growing French-Canadian population coming to work in Lewiston’s bustling textile and shoe mills. The Dominicans hired architect George M. Coombs of Auburn, who designed many other landmark buildings of the era, including the Kora Temple and the Lewiston Public Library. Coombs’ architectural firm remains in business today in Auburn, operating under the name Harriman Architects + Engineers. (Harriman was hired to design the modern addition to the Dominican Block). The original blueprints for the Dominican Block in 1882, by Architect George M. Coombs, are shown at-left. 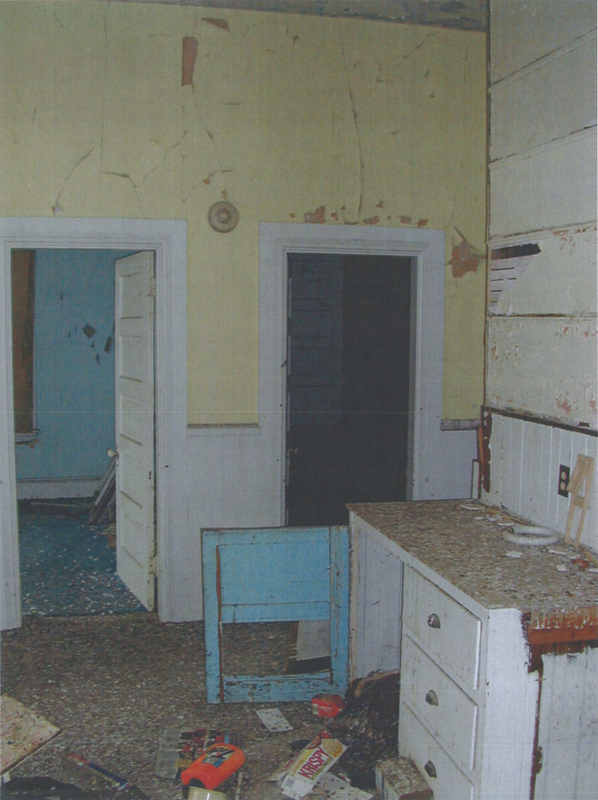 They were found in Harriman's archives when Lyme purchased the building in 2002. On January 8, 1883 the school opened its doors with the “Grey Nuns” from the Sisters of Charity of Saint Hyacinthe, Quebec serving as teachers. The Grey Nuns can be seen faintly in the second story windows in this circa 1883 photo, but their religious beliefs prevented them from posing for the photograph. St. Mary's School was the third French school in Lewiston-Auburn, and was originally housed in the Dominican Block. More than 650 children, ages 6 to 13, almost all of whom had never set foot in a classroom, met at St. Peter’s church at Ash and Bartlett streets and to the astonished looks of the Americans, went in great procession from there to the other side of the city to occupy the new school, the Dominican Block. A translation of the January 11, 1883 article in Le Messager (the Franco-American Newspaper) reports on the excitement of the opening (click here to read). The Dominicans created not only a school, but a cultural hub for the growing Franco-American community in Lewiston. The crown jewel of the Dominican Block was the soaring auditorium space on the 4th Floor, which was the home to many musicals, plays and operas that were popular among the Franco- American residents at the time. Performance groups put on shows such as the comic opera “Les Cloches de Corneville,” with local mill workers performing alongside seasoned actors. In addition to the academic and cultural use, the Dominican Block was originally developed with two ground floor retail spaces, framed by cast iron storefronts which have been preserved and restored. In an early photo the southeast retail space is occupied by the Montreal Quebec Furniture Company, which was there from 1884 to 1898 when the Guilmette Company (also furniture) moved in and stayed until 1912. The Dominicans had a number of different retail tenants during their ownership including furniture stores, jewelers, dry-goods, physicians and hairdressers. Our Lincoln Street neighbor FX Marcotte Furniture first opened for business in 1888, and has been a fixture of Lincoln and Chestnut street ever since. As the Franco-American population expanded and the student population outgrew the building, the Dominican Block was sold into private ownership. The building was first sold in 1916 to Hyman Isaac Glousky, who in turn sold it two years later to Philias Foucher and Ernest Thibault. Thibault and Foucher rented the retail space to a variety of uses until 1930 when they opened their own jewelry store. It is unclear how the upper floors were being utilized during the first years of their ownership, but by 1926 directories listed rooms for rent. By the 1930s the rooms were listed as apartments, and around this time two vertical air shafts were inserted through the building to provide fresh air to the living quarters. The apartment use of the 2nd and 3rd floors was terminated as of 1973, and the Pine Tree Warriors used the building for a variety of fundraisers and events until they finally disbanded in the late 1980s as membership dwindled. In 1980 the Dominican Block was added to the National Register of Historic places, one of the first of Lewiston’s many landmark buildings to be listed. The Pine Tree Warriors pose alongside the Chestnut Street side of the Dominican Block in this undated photo. The Dominican Block fell into disrepair following the Pine Tree Warriors, and was used for a variety of purposes in the 1990s. A YouTube video recently surfaced showing a 1988 concert by the band Illusion that appears to have been held in the Ground Floor of the building during its days as the clubhouse of the Pine Tree Warriors. An August 26, 1994 article in the Lewiston Sun Journal covered the opening of the “Twin Cities Boxing Club,” which was housed in the Dominican Block and run by Bob Eccles, who had been an amateur boxer in Lewiston during the 1970s. The Sun Journal’s coverage at the time of the opening mentions that the ground floor housed a boxing ring once owned by the great Rocky Marciano! The Boxing Club painted the exterior walls their team colors of red, white and blue. The Twin Cities Boxing Club had painted the ground floor of the facade red, white and blue. The paint had to be removed carefully to restore the building to historic standards. All that remained of the once glorious ballroom on the 4th floor was this little balcony. 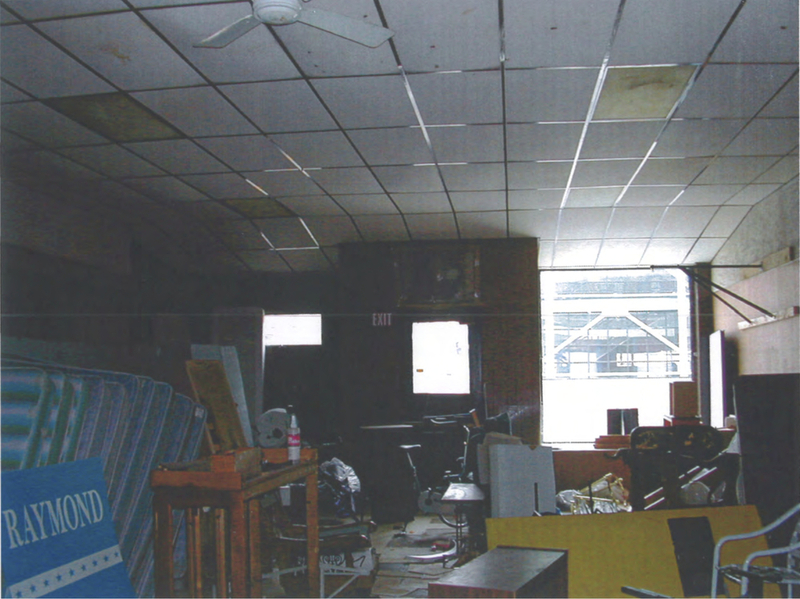 Water damage, pigeons, and many years of neglect and vandalism had destroyed the rest. The mezzanine over the snackbar of the 4th floor ballroom. First converted to apartments in the 1920s, the 2nd and 3rd floors of the Dominican Block became tenement housing for much of the 20th century. Many years of paint and wallpaper were removed during the restoration. One of the last uses of the Dominican Block before restoration was a mattress and used furniture store on the ground floor. 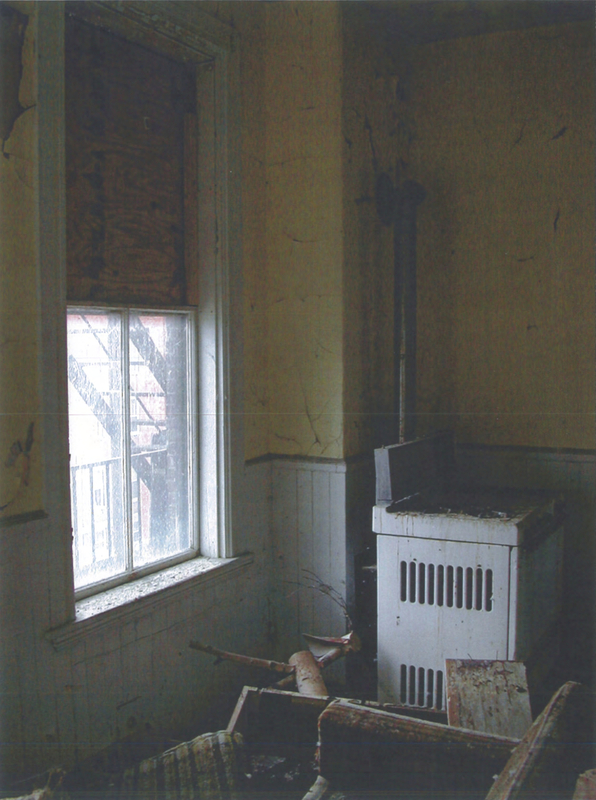 When Lyme Properties bought the property in 2002 the building had deteriorated badly and was occupied by pigeons on the upper floors. The upper windows had long been boarded over, and the facade of the building had been neglected and was covered in a patchwork of paint and temporary fixes. Lyme immediately secured the building to prevent further degradation, and undertook the remediation of environmental hazards (mostly pigeon guano). A full renovation of the building began in 2006, including an exterior restoration that was completed to historical preservation standards. That involved repair and repointing of the brickwork, the installation of custom-made wooden windows to match the originals, and the restoration of the ground-level facade and cast iron storefronts. The vertical air shafts that were added in the 1920s were removed, and the roof restored to its original lines. Lyme Properties has engaged Harriman Architects & Engineers to design an addition for the south-side of the building, providing an elevator and a secondary egress stair to meet modern ADA and life-safety requirements. The new entry vestibule and elevator will allow for easy and convenient access to all five floors in the building. It is only fitting that the architectural firm of George M. Coombs be the designers of the modern addition to this historic landmark.